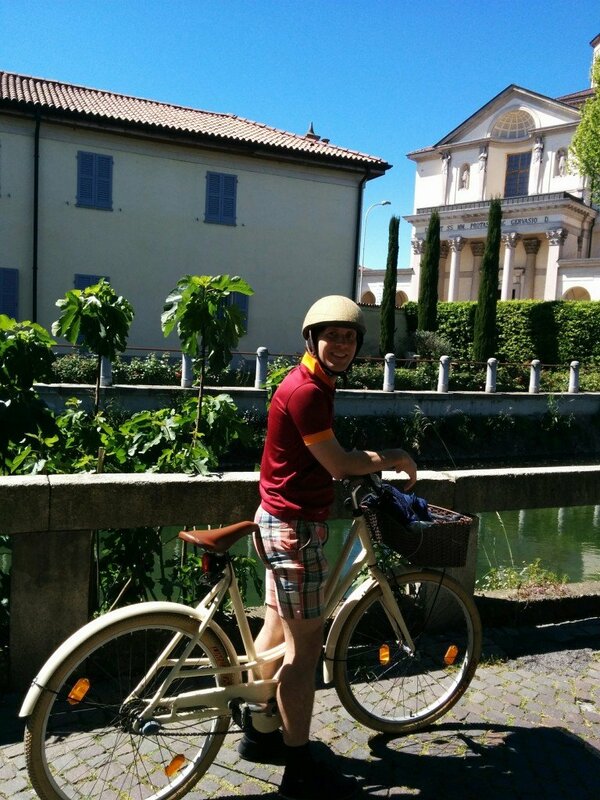 From Milan and the neighborhoods around the IMS, there are beautiful bike trails to help you get your mind off medical studies — or reflect upon what you have learned. Let’s take a trip north toward the Alpine foothills. One of the most magnificent things about Milan are its mountainous surroundings. 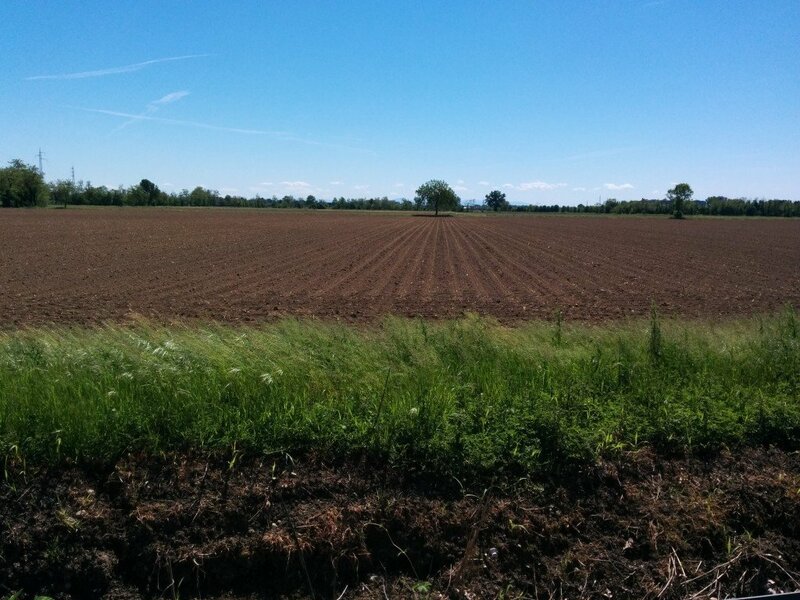 The city is encircled almost 180 degrees by the Alps, but the land directly around Milan is remarkably flat. 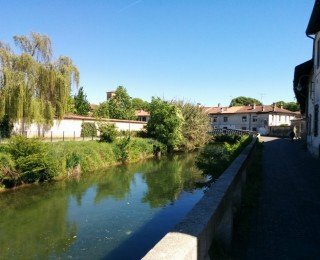 This means that you can get very fresh air and fabulous views by bicycling to the coutntryside, and even if you are not a regular cyclist, the trip is not physically taxing. 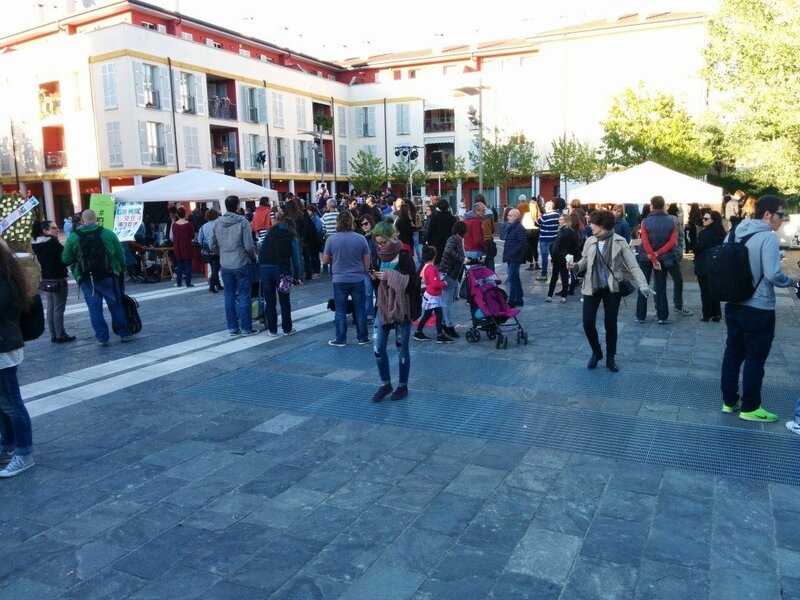 Monday, perfectly sunny and spring-like, was a national holiday, Liberation Day. 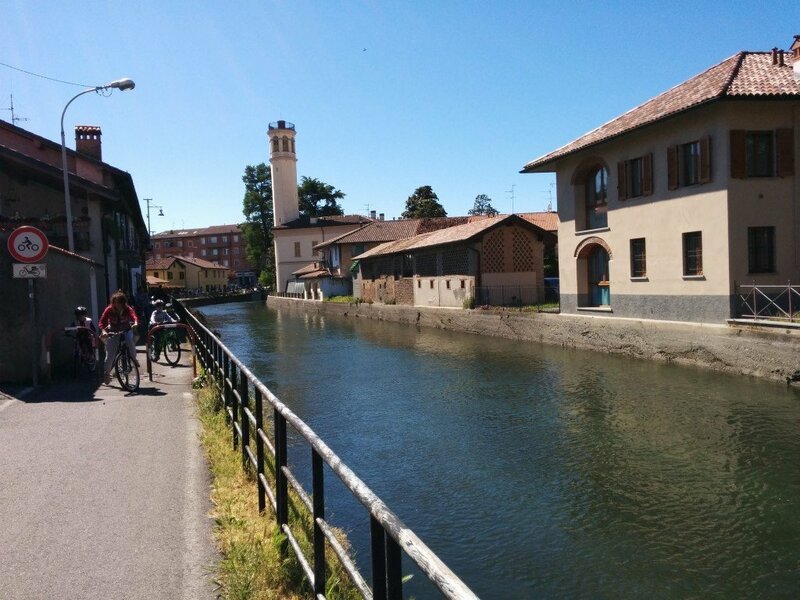 I and a friend decided to take the bike path along an irrigation and mill canal called the Naviglio Martesana, built in the 15th century. 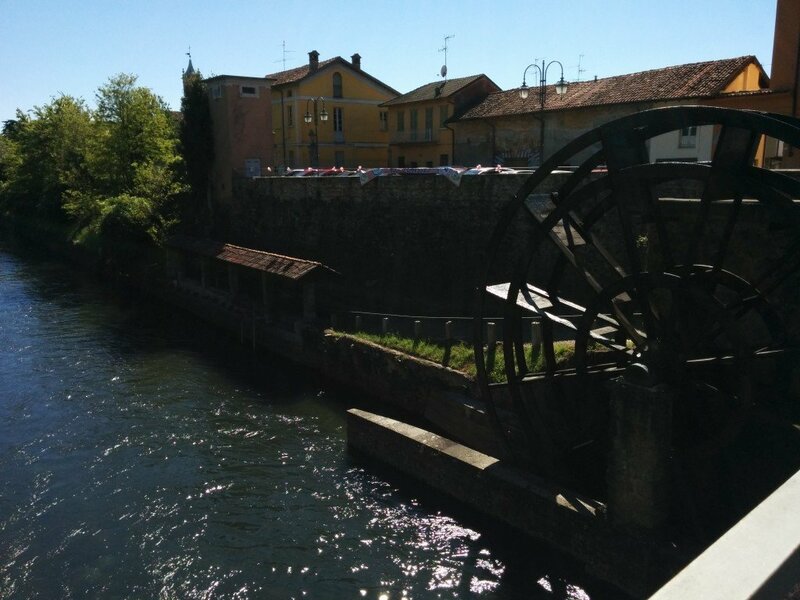 It winds from the castle at Trezzo sull’Adda to Milan at the Lambro River, which runs by the IMS and the neighborhood of Lambrate where I and a number of other students live. 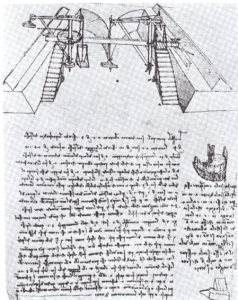 Leonardo da Vinci helped design a system of locks for the canal — which are still in place, and an example of which we will see in a moment. 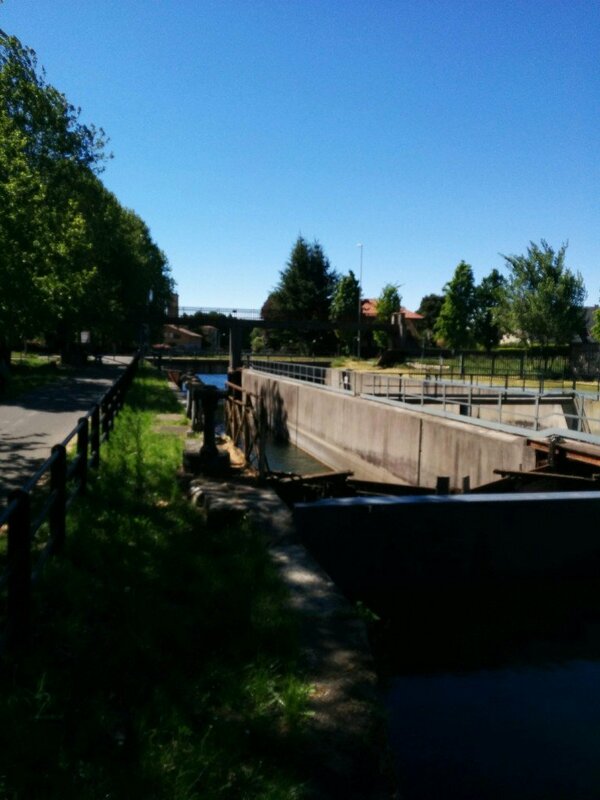 The bike path follows the east bank of the canal, passing through a number of villages along the way. It totals 32 kilometers, although of course, you do not have to go the entire distance. 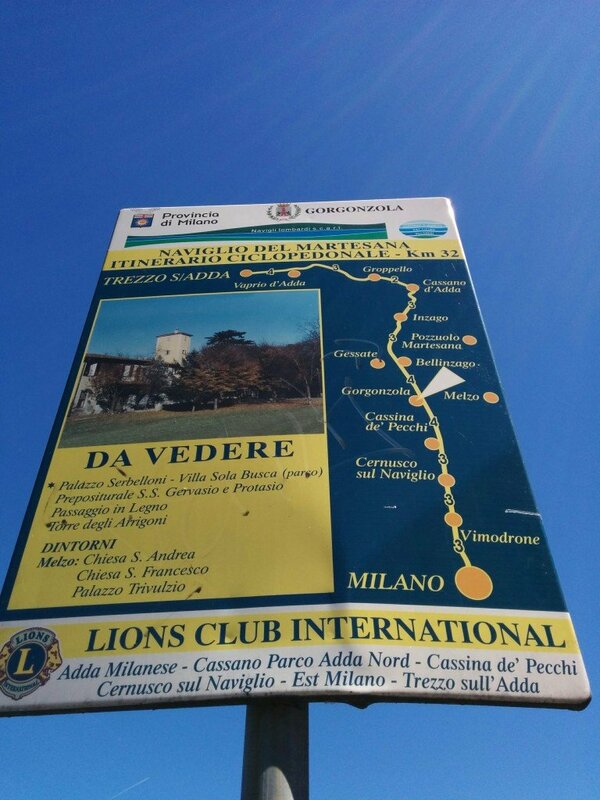 At any number of stopping points, there is a public transport station which will take you (and your bike) back into Milan. About 10 minutes after leaving my home, I was out riding in classic European countryside. 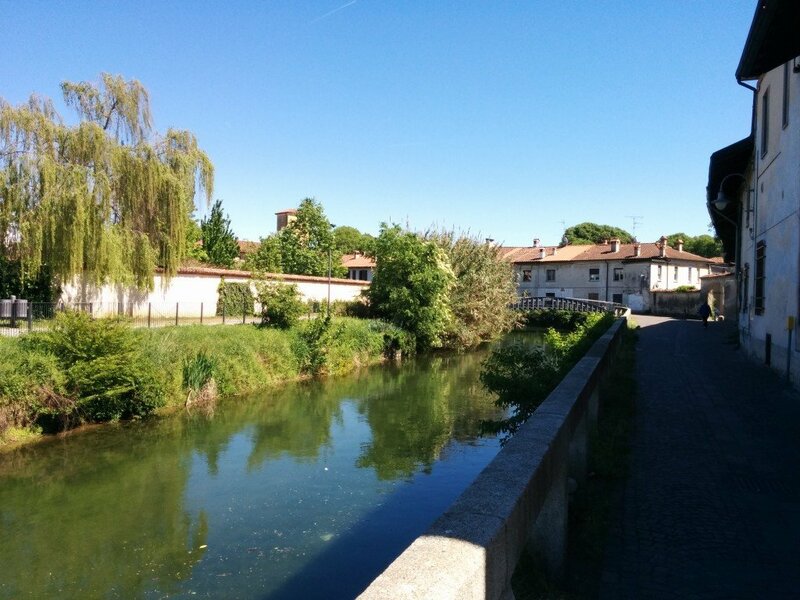 My friend met me in Gorgonzola, a village along the canal. Debate ensues about Gorgonzola’s relationship to Gorgonzola cheese, but the village was certainly one of the cheese’s trading posts. Leaving Gorgonzola, soon, the plains spread out in front of us, including the mountains to the west, north, and east. Click on the picture to enlarge the panoramic view. 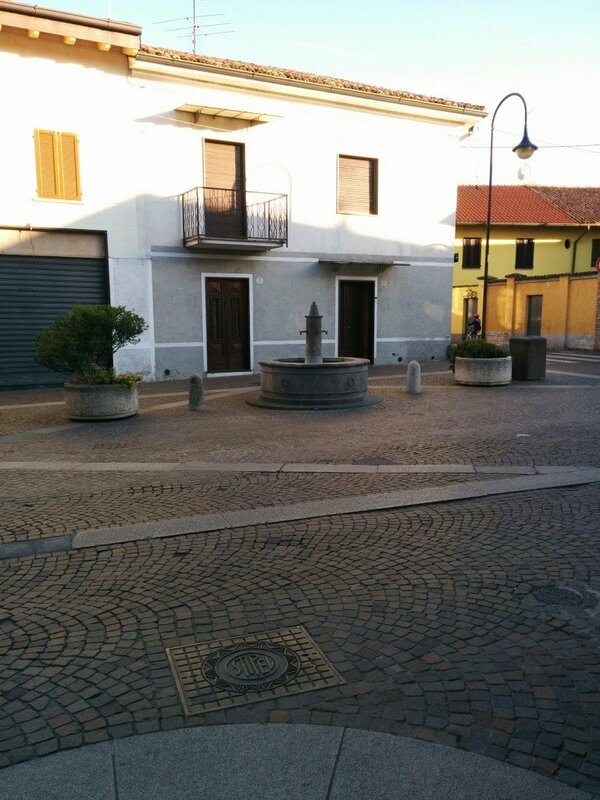 …and giant family mansions, like the Villa Aitelli (the building with the tower), built in the 16th century. 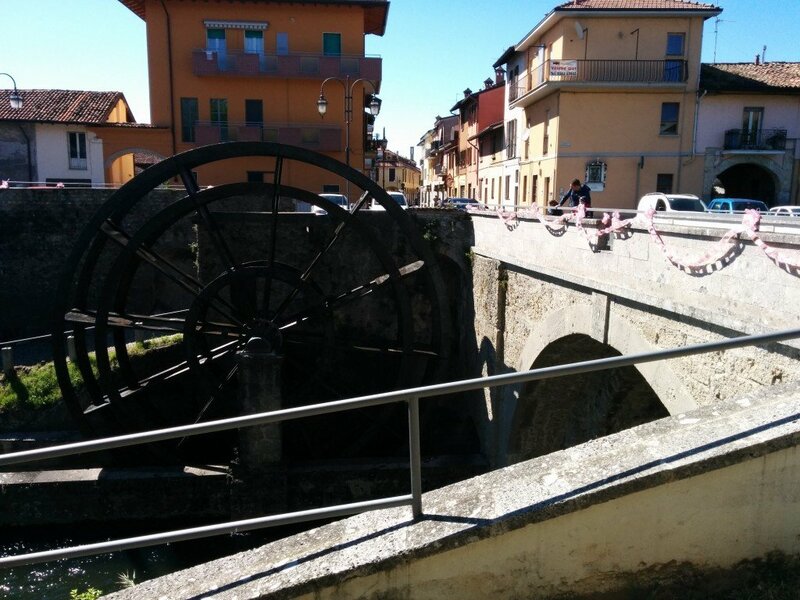 …and a 17th century mill, the “ruotone” di Groppello, which, as we arrived, was actually rotating from the canal stream. 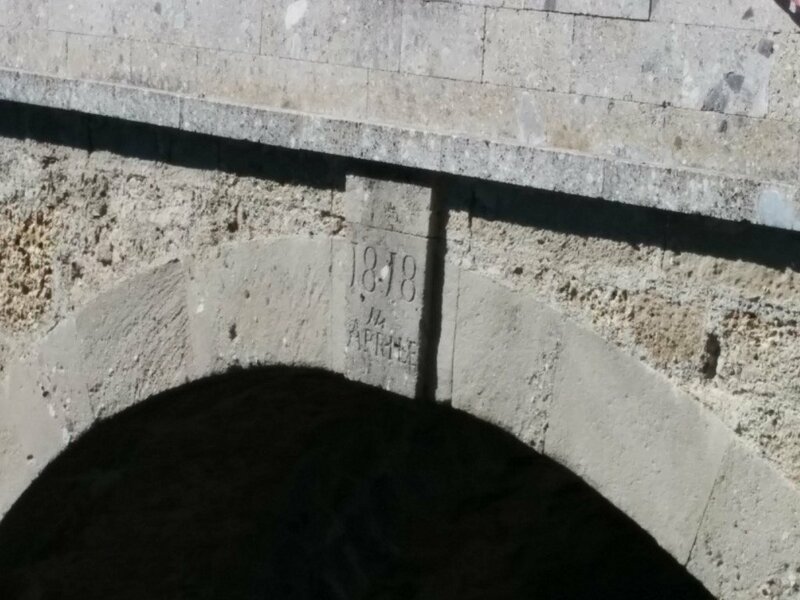 Check out the date on the bridge: April 14, 1818. 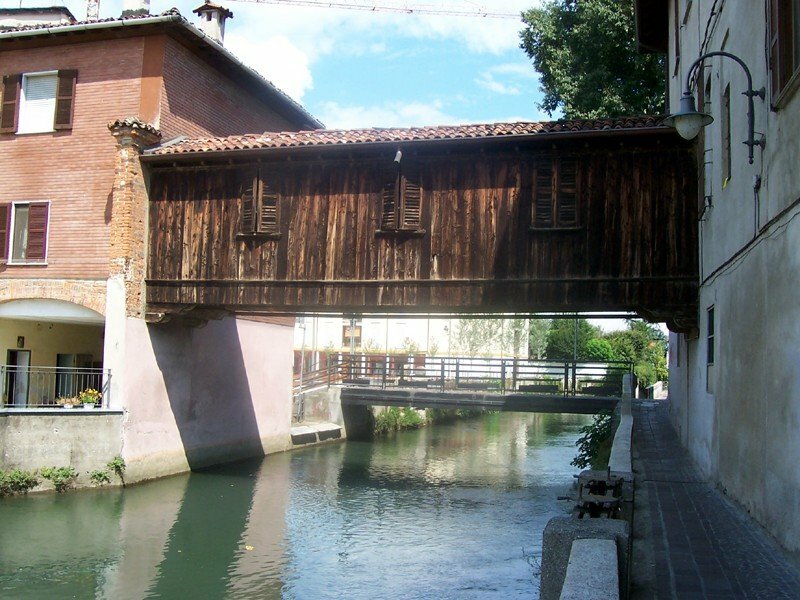 The canal reached the wide Adda River, which originates in the Alps near the Swiss border, and flows through Lake Como. We walked our bikes on a footbridge over the river. Here is another panoramic view. 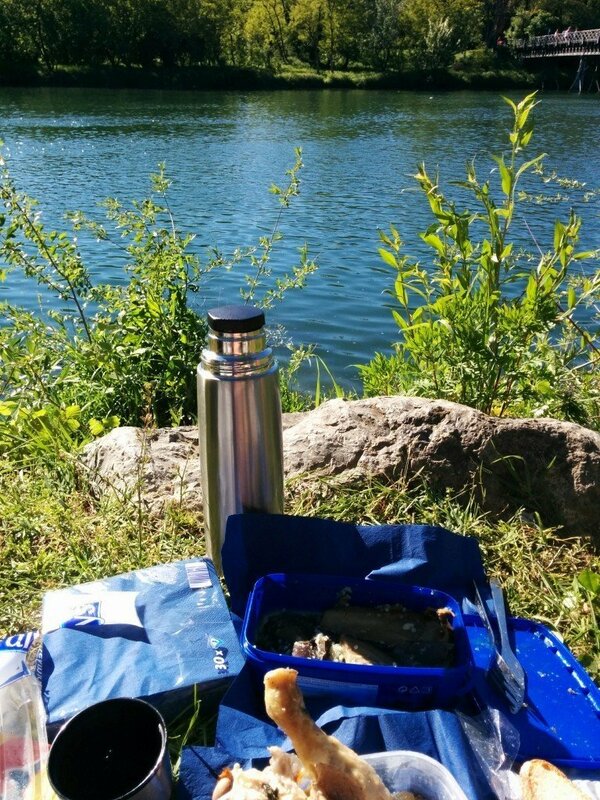 We sat down for a picnic on the riverbank, by the bridge, eating eggplant and chicken that I had prepared Sunday night. 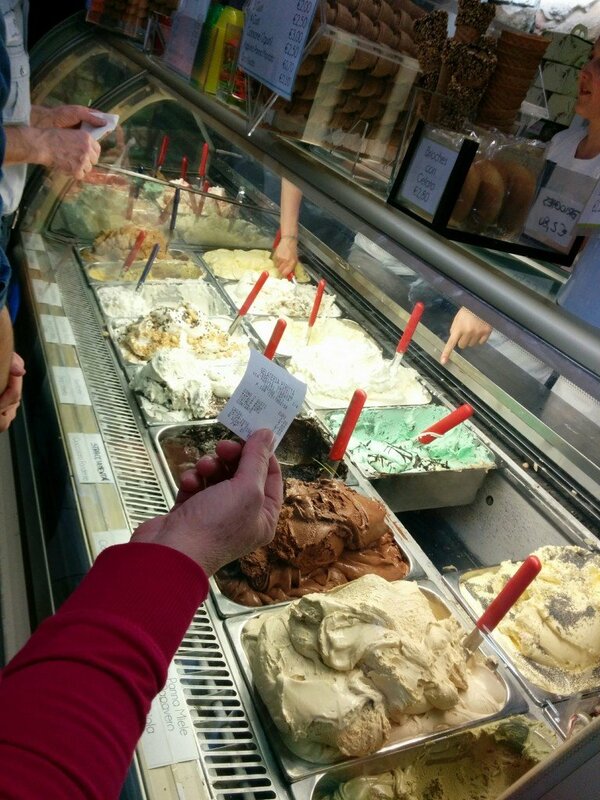 The return trip took us past a popular ice cream store. 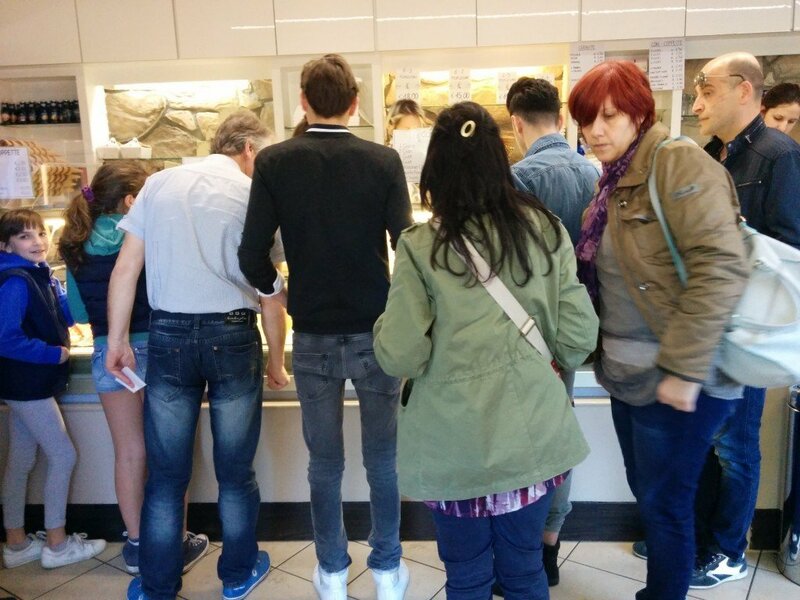 It seemed like the whole village came that day to get gelato. 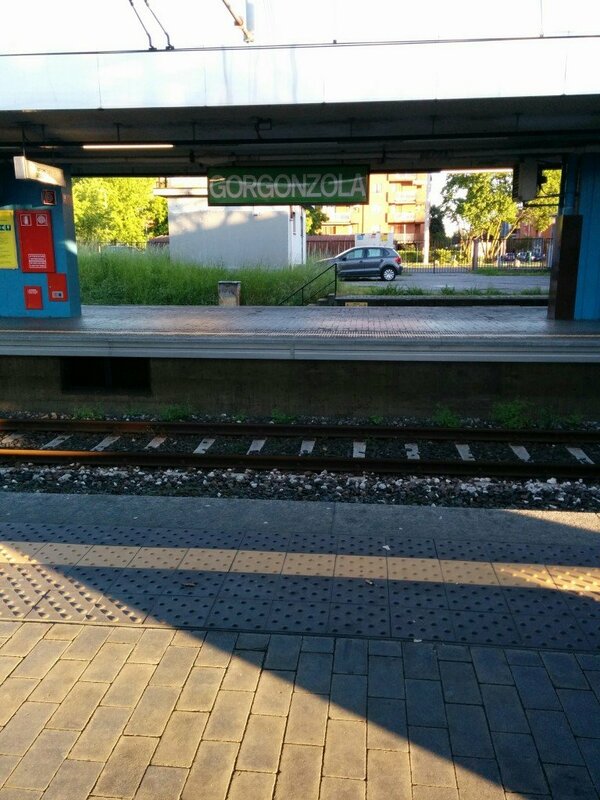 We found our way back to Gorgonzola, where I was to drop off my friend and take the train back to Milan. Gorgonzola looks classic and well-kept. A holiday party had taken over the town square, with a live band playing a kind of funky blues rock with a string section. The party grabbed my attention such that I forgot to take a picture of one of the village’s landmarks: a wooden covered bridge over the canal. 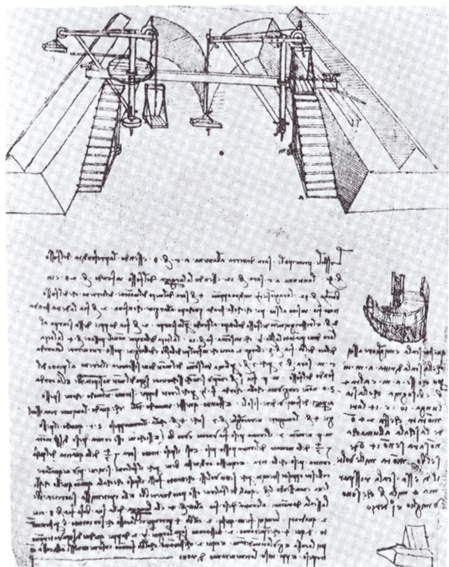 So instead, here is a public domain picture from Wikipedia (credit to MarkusMark). 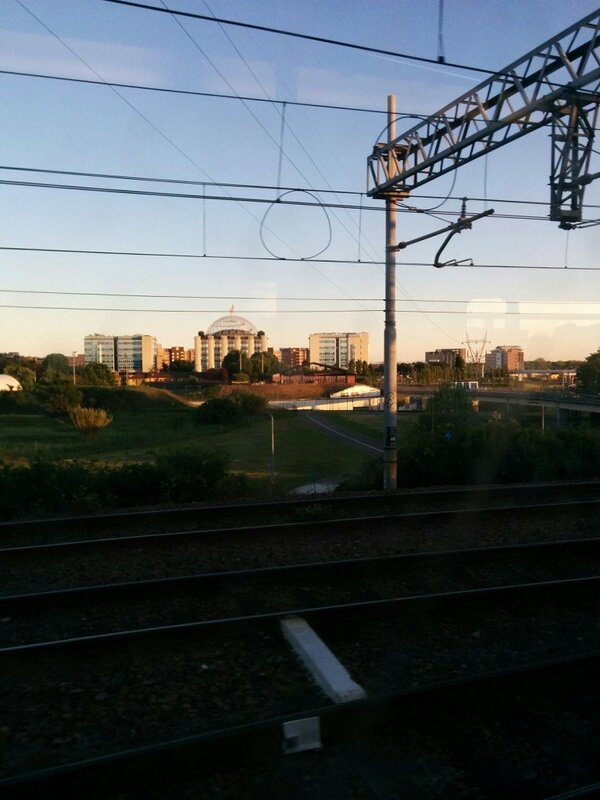 …passing the IMS on the way home. It is in the background, the second skyscraper from the right. In the foreground is San Raffaele Hospital. I got off the green line at Lambrate station and cycled home in about four minutes. 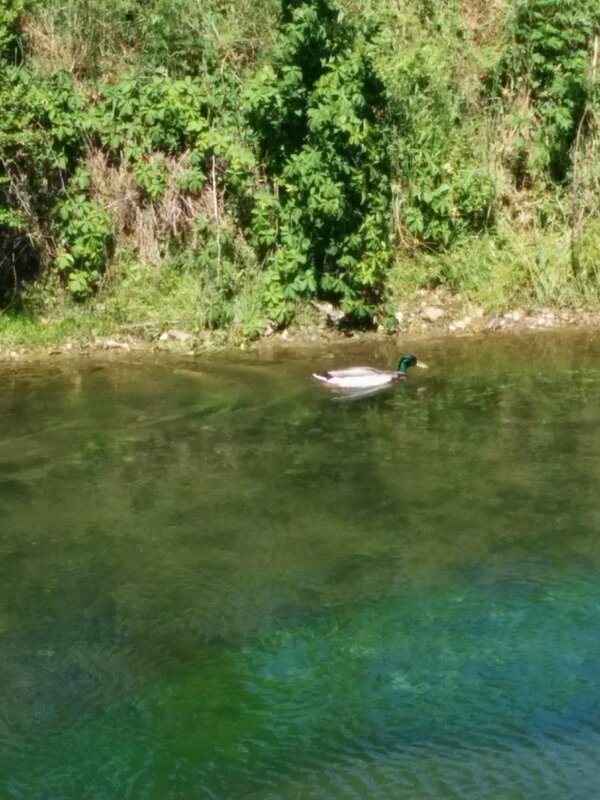 Earlier in the day, while I was waiting for my friend in Gorgonzola, I saw a duck in the canal. You may note, from the shape of the waves, that it is paddling upstream. When I saw the duck, I was reminded of something that people say about the students at my undergraduate institution in California: they are like ducks. On the surface of the water they seem calm, but underneath, their legs are paddling wildly. The school culture was to “be stressed out — but don’t show it!” — and indeed, my alma mater is famous for appearing cheerful. I wondered if that described me, now, too, as a med student at IMS. Am I again a duck? 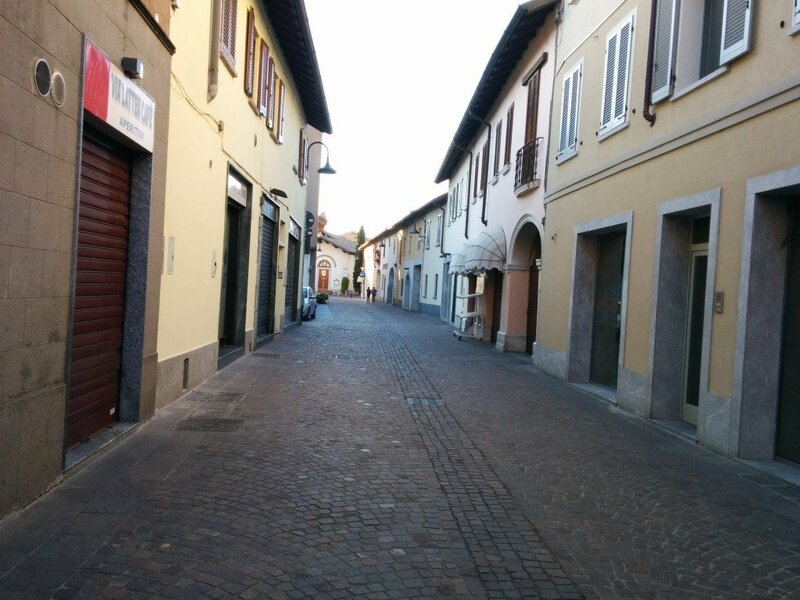 This person who posts pictures of perfect Italian sunshine, of fascinating anatomy laboratories and of himself hugging Grey’s Anatomy — is he stressed out underneath? Honestly? Not very much. Shouldn’t you be?, you might ask — after all, you’re studying medicine. It is a good point. However, I am 39, not 19, as I was when I started my undergraduate degree. Over the years — through much error and error — I have learned to do the things you need to do not to stress out (or, at least what works for me). Go to bed early (around eight o’clock is wonderful). Eat a big breakfast, a medium lunch, and a small dinner. Do not procrastinate, nor drink much, and get exercise every day. If you follow what are basically simple rules, much of the burden is removed from the academics. As to whether I appear cheerful, well… I do not think so. Not as much as I used to appear. With time, we experience tragedy — hurt, institutionalized abuse, deceit, loss — in addition to joy, hope, love, and optimism. Each of us reacts in his own way, and for me, it has been to adopt a more neutral emotional tone. I am no longer a perpetually-smiling Californian undergraduate, but I am probably more grounded than I was back then. …there is also something about living in Europe that puts one’s stress into a comforting historical perspective. For the years I was in Paris, this perspective was particularly clear, and Monday, as we wiggled and bumped our way over stone bridges and by clay houses, many centuries old, I saw it again. My friend and I took a path already followed by probably hundreds of thousands of cyclists and walkers and an untold number of shipments of cheese. Furthermore, these settlements have seen wars and empires. Romans, French, Austrians, the Dukes of Milan, and plenty of other conquerors, have trod these roads, all the time surrounded by mountains much older than us humans ourselves. What matters the loneliness of one person, compared to the grand sweep of history? The duck may be going it alone upstream, but the canal is longer than he can ever paddle and crosses a vast, ancient plain, ruined and built over and over again, and bathed, at least Monday, in sunshine.